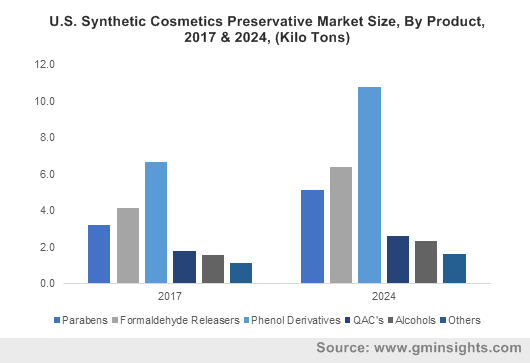 Cosmetics Preservative Market size was over USD 835 million in 2017 and industry expects consumption of above 180 kilo tons by 2024. Growing inclusion of preservatives in cosmetic products owing to increasing importance of enhancing shelf life and upgrading product quality may grow cosmetics preservative market size. Rise in demand for multifunctional and premium cosmetics has led to incorporation of sophisticated preservatives which may favour industry growth. Growing beauty consciousness is increasing sales for skin care products, thereby driving cosmetics preservative market growth. Cosmetics preservative are used as antioxidants, antimicrobials, and stabilizers. Biodegradable elements in beauty products may decay owing to the presence of numerous microbes. Water content in products can decompose cosmetics products, if kept for a long time. Increasing usage in natural skin care products owing to presence of pure oil blends and extract which may shorten product lifespan will drive industry growth. Global cosmetic market is likely to surpass USD 425 billion by 2024. Shifting trends towards personalised beauty products supported by high investment in research to develop specialised goods will contribute towards industry growth. Rising importance of effective preservation systems combining synergistic effect of protective blends to balance cost and efficiency will have positive effect on product demand. Phenol derivatives as preservatives are used in cosmetic products for years and are beneficial against a wide range of microbes. Phenoxyethanol is a glycol ether, which is used in cosmetic products as a preservative and has emerged as potential alternative to parabens. Phenol derivatives are used as stabilizing agents in various products, such as perfumes, sunscreens, shampoos, ointments, and creams. Increase in diverse products to encounter consumer demand, healthiness and specification, along with using proper ingredients is anticipated to fuel demand for cosmetics preservative by 2024. Adoption of organic ingredients to decrease contamination, increase quality along with meeting required specification may favour industrial growth. Government initiatives reinforced by strong R&D for safe preservatives to promote the use of natural ingredients has prompted huge investments on technology innovation. Technological advancement to increase product flexibility and shelf life will propel cosmetics preservative market share. Industry penetration in young generation along with increasing consumption of cosmetic products is anticipated to have a positive outlook on cosmetics preservative demand. Stability factors in organic ingredient incorporation, high cost of natural protective agents may hamper industry profitability, thus affecting cosmetics preservative market price trends. Stringent regulatory standards by FDA and EU commission limiting the usage of parabens and formaldehyde releasers in beauty goods may act as another restraining factor towards industry growth. Cosmetics preservative market from plant & herbal extracts is estimated to surpass USD 120 million by 2024. Grape seed, rosemary and neem extracts are extensively used for their effective antimicrobial competence. Technical advancements in extraction along with development of hurdle technology which utilizes combination of protective agents to inhibit microbial contamination will stimulate product demand. Cosmetics preservative market size from phenol derivatives may witness significant gains up to 7%. Increasing consumption phenol derivatives in toiletries, shampoos and shaving gels due to their long-lasting effect may inspire product demand in foreseeable timeframe. Shifting focus towards men’s grooming products owing to availability of varied multifunctional products will propel phenol derivatives demand. Cosmetics preservative market size from hair care application may exceed USD 400 million in forecasted timeframe. Growing consciousness about hair damage has increased consumption of organic ingredients which contain glyceryl aloe Vera, panthenol rosemary, wheat germ, avocado sunflower, lavender and olive oil. These oils are effective in restricting saprophytic bacteria and fungi formation which are the major cause of cosmetic contaminations supported by imparting therapeutic benefits in beauty goods. These factors may contribute towards driving industry growth. Cosmetics preservative market from fragrances & perfumes application may observe gains over 6% owing to accessibility of premium brands through effective distribution channel supported by rising consumer purchase ability, which may escalate product demand. Perfumes are mixtures of essential oils, aromatic compound and water which creates a favourable environment for microbial growth and may hamper product quality. Synthetic preservatives including alcohols and formaldehyde compounds have antimicrobic features which helps maintaining product quality and stability. 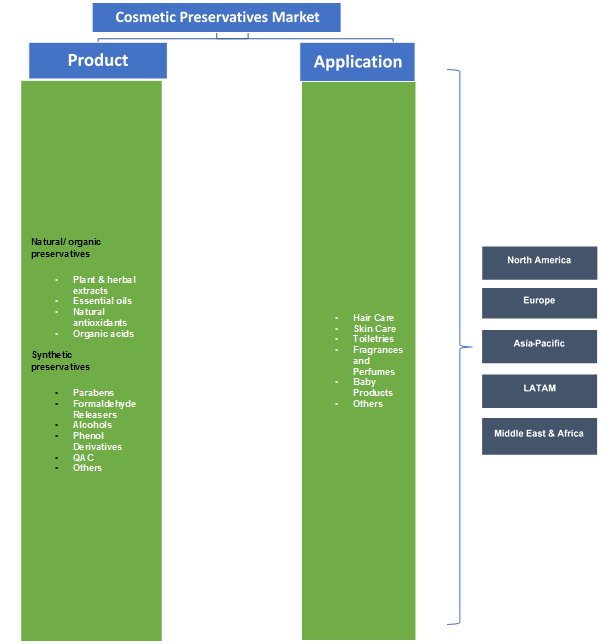 Asia Pacific led by South Korea, Japan, India and China, cosmetics preservative market is estimated to surpass USD 350 million in the estimated timeframe due to rising consumer awareness about health apprehensions due to UV exposure and air pollution should grow skin care product demand in the region. Rising development of formulation compatible protecting agent to achieve maximum efficacy will stimulate regional product demand. Europe led by UK, Italy, France and Germany, cosmetics preservative market may record robust gains over 7%. Strict regulations related to processing of beauty products and usage of preservatives has encouraged effective manufacturing beauty goods which may stimulate product demand in this region. Brazil cosmetics preservative market may witness mild gains due to growth in the employed population, which has led to increased demand of luxury cosmetic product will enhance regional market size. Global Cosmetics preservative market share is slightly consolidated and competitive with major manufacturers include Ashland, Dow Chemicals, Brenntag AG, Lonza Group, Chemipol, BASF SE, Symrise AG and Clariant. Market is categorised with product innovation balancing use of less quantity with high effectiveness along with articulating more constant and superior-quality products. Manufacturers are involved in strategic associations including mergers & acquisitions and capacity expansion to adopt diverse & innovative technologies with increase production capacity to cater intensifying demand. Cosmetics preservatives are ingredients which are intended to constrain the growth of microbes in the cosmetic product. Preservatives help to preserve products and ensure resilience of cosmetic products. Mounting demand for natural & herbal constituents in cosmetics is projected to enhance demand for cosmetics preservative.